According to StatCounter.com, mobile device users make up for 14.35-percent of the worldwide Internet browsers as of February, 2013. This is more than 6-percent higher than it was a year ago. Although the numbers are starting to level out somewhat for the two months prior, there is still continued growth. Mobile Internet browsing is an important aspect of life worldwide. Why should you care about such usage by mobile device users? 1. Accommodating – According to the numbers above, nearly one out of seven people that visit your website could be using a mobile device. If the pages are too detailed and image heavy for a mobile user to benefit from, they will move on and most likely not return. What makes these pages unattractive for mobility? 2. Business Perspective – According to Statista, Inc., 11-percent of e-commerce sales were completed from mobile devices. 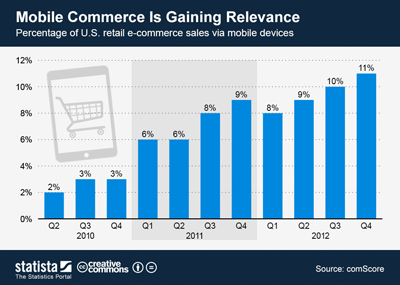 If you own an e-commerce website, approximately 1 out of ever 10 buyers could be from mobile devices. The data also suggests that this number is continuing to rise at it has been since 2010. If your website isn’t mobile device friendly, you could be missing out on a great deal of income. If you haven’t invested time into discovering what you can do to improve the functionality of your site, you better do so quickly as your competition is raking in the benefits. 3. Not a Fad – As smartphones were coming into the spotlight, many speculated that mobile computing of this nature was nothing more than a fad and the tablet computers are nothing more than experimental units that won’t gain traction. Nearly every statistical analysis since 2010 shows a steady growth of mobile technology. As these devices become more and more sophisticated, it could be laptops and netbooks that could be viewed as fads. 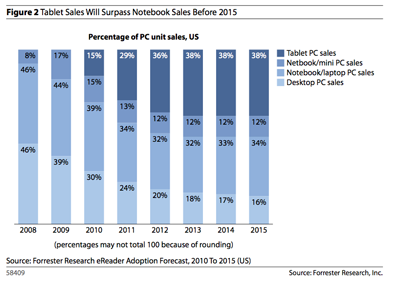 According to the data provided by Forrester Research, Inc., laptop and netbook sales will level as desktop PCs drop. However, tablet PC sales grew surpassing each PC unit type as of 2012 and is estimated to continue being on the top for the next few years. This doesn’t mean that mobile PC computers were a fad, though. This just means that people are drawn to mobility and practicality over general functionality in a heavier and more awkward to carry product. 4. Site Longevity – As more and more mobile devices take to the Internet, you need to make preparations to make sure you can capitalize on this growth. Before you realize what is happening, mobile devices could surpass desktop and laptop browsing and your site could suffer by not providing a method for these visitors to utilize. As the competition is very high for virtually any niche on the Internet, you need to ensure that your site is among those that can be utilized by all before it fades to a dim memory of its previous former glory. Redesigning your site for mobile functionality can be accomplished a number of ways depending on how your site is constructed. Some sites can use CSS coding to reshape images and more to fit hand-held screens, while others can utilize redirected domain names such as http://mobile.yoursite.com in order to accommodate this growing trend of mobile browsing by providing a smaller version of your site. Don’t dismiss the numbers because it is doubtful that your competition has.